The Gaelforce Sky Run is a unique mountain running event taking place in the Maamturk mountains in Connemara, Co Galway. This stunning route is accessible only for the event and covers 22km and 3 peaks. 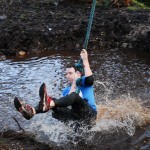 The Gaelforce Sky Run is suitable for experienced mountain runners only. A prize fund of €1000 will be on offer for the winners.